Rodale Institute’s Farming Systems Trial (FST) has been comparing organic and conventional management systems since 1981. Nodules in roots from soybean plants in the manure-based organic system were compared to roots from the conventional system. 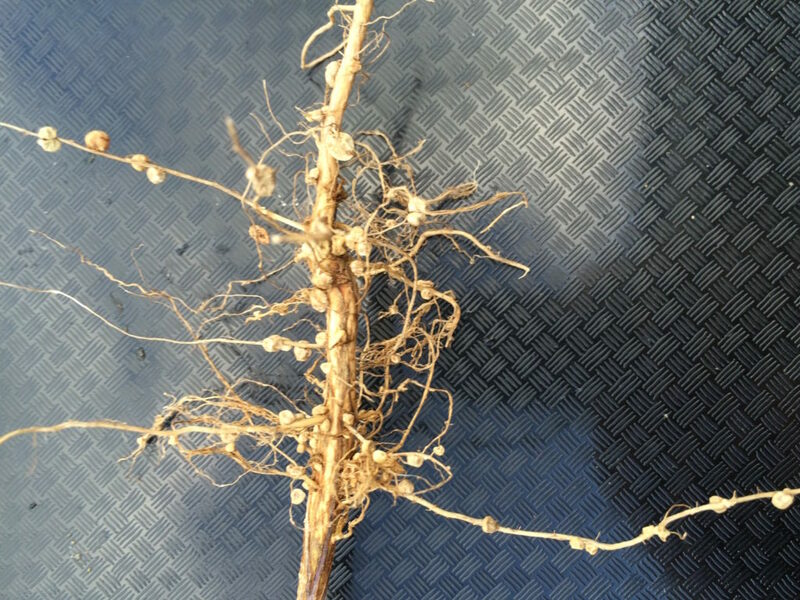 Legume plants, such as soybeans, have nodules on their roots where rhizobium bacteria convert atmospheric nitrogen (N2 gas) into plant-available nitrate-nitrogen. The energy needed to do this process comes from photosynthesis, where sunlight energy is stored in the bonds of simple sugars. Because excess amounts of nitrate-nitrogen are present in the conventionally-managed field due to the addition of synthetic fertilizers, plants do not allocate energy into forming fine roots to access more nitrogen from the soil profile and nodulation is concentrated around the tap root so the rhizobium bacteria are only feeding each individual plant (Figure 1). Figure 1. Soybean plants grown in the conventional system have few fine roots, and the nodules are concentrated on the tap root. Photo taken on 9/3/2015. In the organic manure system, more fine roots are developed and nodules are found throughout the fine roots (Figure 2). Greater amounts of fine roots assist the plant in obtaining a variety of nutrients from the soil profile and nodules on these fine roots will help distribute nitrogen throughout the soil profile for subsequent crops. Figure 2. 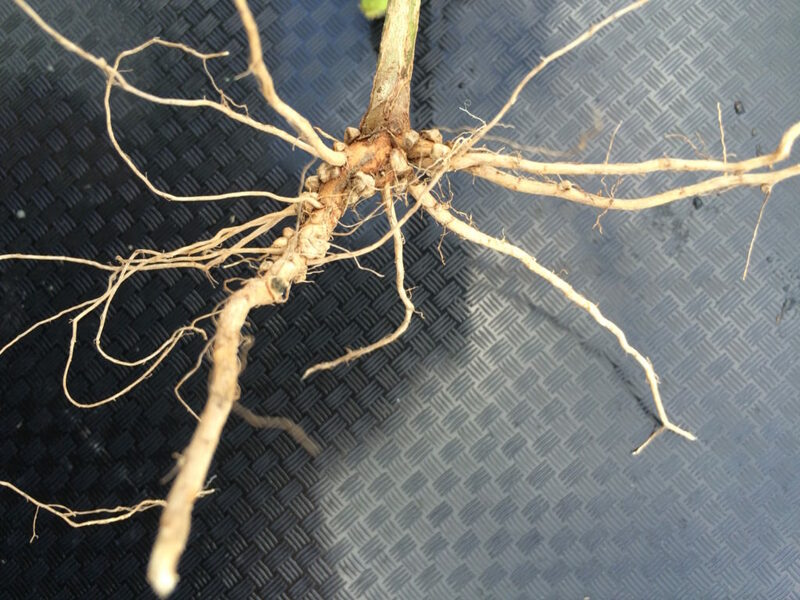 Soybean plants grown in the organic system have far more fine roots and root nodules. Nodules are distributed on the tap root as well as lateral roots and root hairs. Photo taken on 9/3/2015.